July 4th is a great time to take photographs of your family. It is a fun day, people are together, the weather is (generally) good and your photos will reflect this. 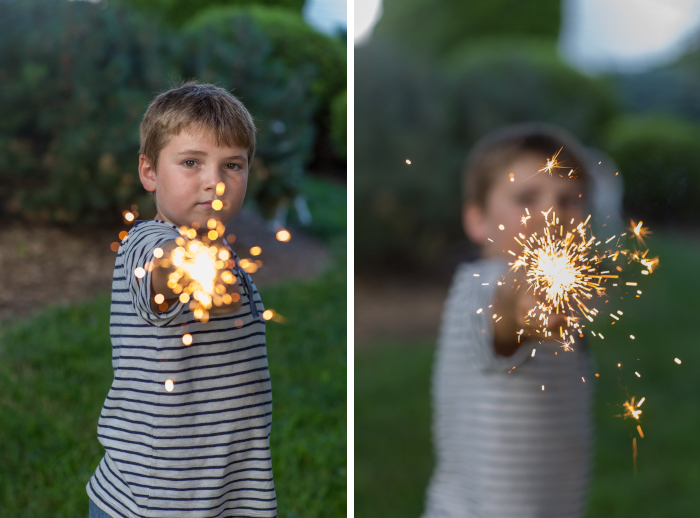 Photographing sparklers, with the right knowledge, is easy. Here are a few tips. 1. Let your children have a few in the early evening, right before the sun goes down. 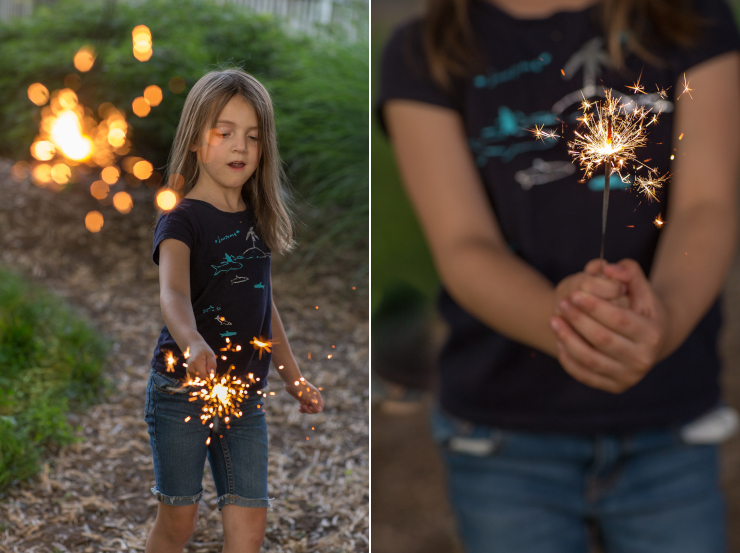 The light from the sun as the sun sets is truly beautiful, plus the ambient light provided by the sparklers enables you to capture the joy on your child’s face as they swirl their sparkler around. Make sure that your flash is off, and, if shooting in manual, make sure your settings don’t blow out all the highlights of the sparkler. 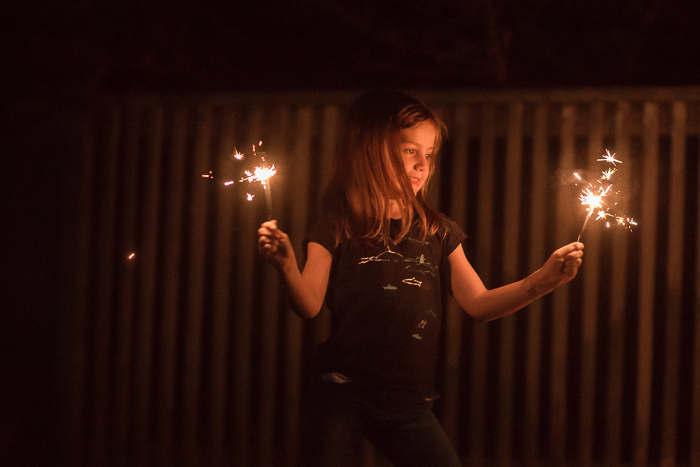 I like to take photos of my children’s faces, as well as a couple that focus on the sparklers themselves. To achieve the blur (bokeh) the aperture should be as wide open as your lens will allow (the f-number should be as low as it can go, with most kit lenses that is 3.5 when the lens is completely zoomed out). If you shoot your child after dark with a sparkler, the results are generally less than inspiring. 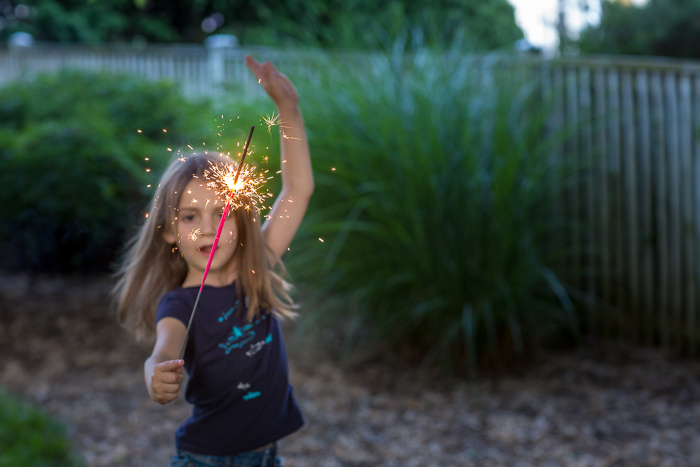 Either your camera’s flash will pop up and wash all the ambient light away, or it will focus on the sparkler and expose for that, leaving a tiny dot of light in the darkness because the light from the sparkler by itself is generally not bright enough by itself to light your child’s face, even with cameras that work well at a high ISO. 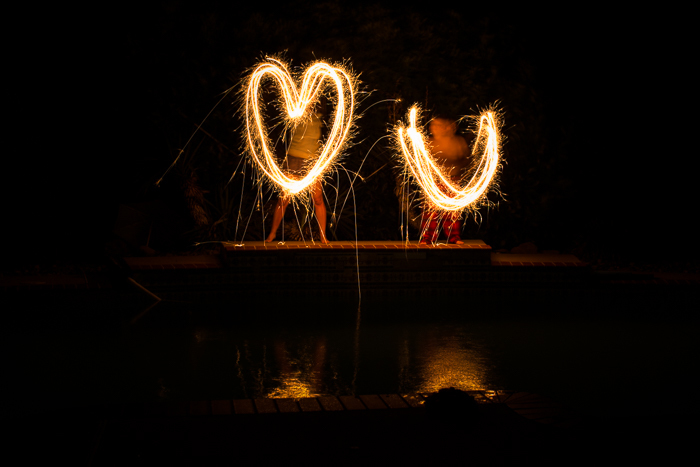 You have two choices at this point: photograph using a long exposure with the intention of capturing sparkler writing (see below for tips on how to achieve that), or use another source of ambient light, such as ground fireworks from a safe distance nearby. In the photograph I use as an example, the ambient light was from a camp fire about 10 feet away from my daughter. Even with the ambient light source, such as ground fireworks like roman candles, or even light from a nearby window, you will be shooting in very low light and need to use a very high ISO and wide aperture (small f-number) to allow as much light in the camera as you can. Do not let your shutter speed drop below 200, otherwise you run the risk of blurring your child or the photograph due to camera shake. 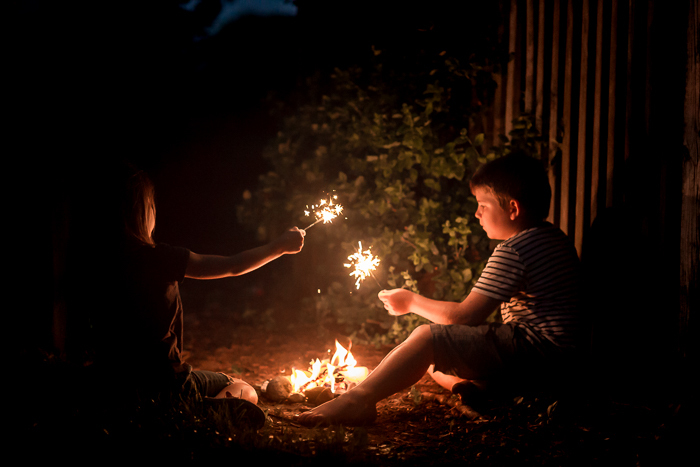 If you use fireworks as your ambient light source, your child’s face will likely be a similar color to the fireworks, which can be either adjusted in post processing, or the cast reduced by waiting to use white fireworks as your ambient light. To capture sparkler writing, a few things need to be in place. Firstly, it needs to be dark, with no dusk lingering in the sky. Secondly, your camera needs to either be on a tripod, or another hard surface, such as a table, as a long shutter speed is needed. Without this hard surface, the image will be blurry. Take a moment to send someone out with their camera to the spot you want your letters to be written. Have the person writing take note of that spot. Focus your camera on the light, and then switch the focus to manual on the lens. 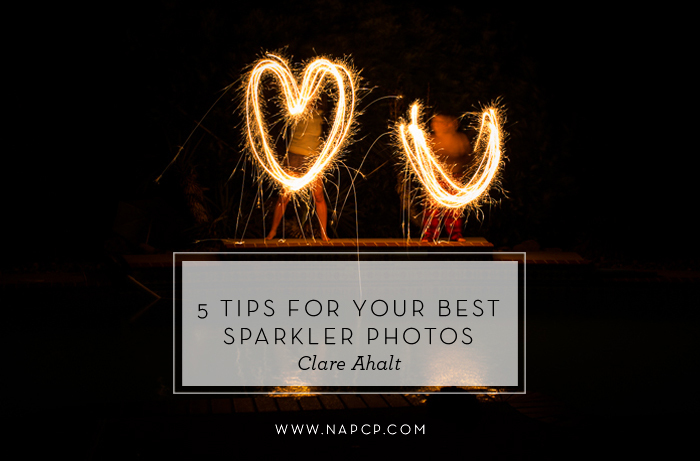 This will help save you time when you begin to write, as your camera does not have to search around for focus as the clock is ticking down on both the sparkler and the long exposure. Make sure that the area you are going to write in is big enough for the word you are writing, and that your camera lens is wide enough to capture it all. The settings that I typically use are: shutter speed: 8-15 seconds, aperture: 3.5, ISO 100. The key is to allow the shutter speed to be the setting that allows the light in. Keep the ISO at 100, because as it is so dark, the slow shutter speed is what captures the light, and motion, from the sparklers. Writing with sparklers is more difficult than you might think (unless you are a teacher that is used to writing on whiteboards). Have the person writing to have their back to the camera and write out to the side so their body does not block the letter they are working on, otherwise if they face the camera, they will need to write the letters as if they were reflected in a mirror (not fun!). You might also want to use the timer on your camera to make sure it does not have any shake, which will result in blur, from you taking the picture. 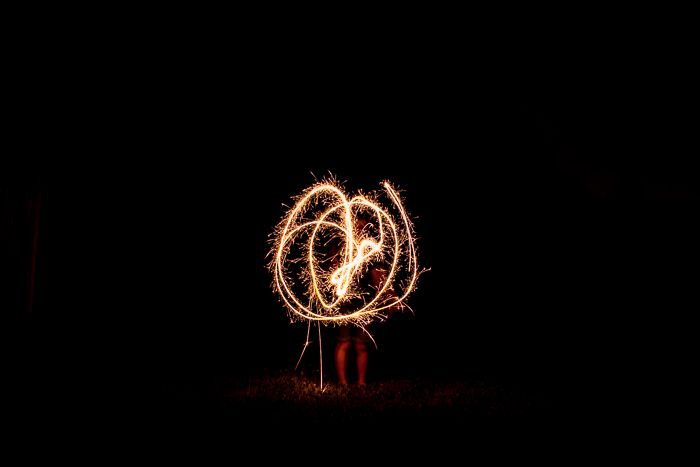 If you have a child that is too young to write a word, have them do their first initial or just wave the sparkler around in a pattern, the results are sweet because, hey, it’s your child! My husband is a veterinarian and this time of year has a number of recommendations to keep pets safe. A lot of pets have anxiety related to the loud noises of fireworks. In some cases it may be appropriate for them to be prescribed medication for the anxiety that will help keep them calm through the fireworks. Unless you know that you dog is not sensitive to the sounds or sights of fireworks the safest thing to do is to keep them inside. If they have any anxiety keep them in a crate or kennel, with medication where necessary, to help them as that anxiety, if untreated, generally leads to destruction inside the house. If your dog is left outside and has anxiety, they may run off, and it’s not fun trying to find them after so it is so important to keep them inside, or kenneled. So many dogs get lost on July 4th due to running away scared from the fireworks, so please keep them safe too! 5. Have fun and stay safe! Love it. So much fun and love that you thought about the pets! Fourth of July Weekend Roundup!